Another exotic adventure in never-never land for Scotland Yard's Richard Jury and his rich, titled sidekick, Melrose Plant. 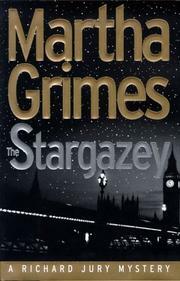 At the Stargazey pub, Jury observed a striking blond woman in an elegant fur coat. He idly followed her to the gates of Fulham Palace, which she entered while he went about his business. That night, the body of a woman fitting that description (hut lacking identification) is found in the Palace gardens--murdered. But Jury knows it's not the same woman. The fur coat provides a trail that leads to old-time movie star Mona Dresser, who'd given the coat to Olivia Inge, her daughter by the late Clive Fabricant. Clive's second wife is lions Kuraukov, aristocratic mother of Nicholas and Sebastian, art gallery owners. At this point, Jury enlists old friend and unofficial aide Melrose Plant to find out more about the Fabricants. The murder victim has finally been identified as one Nancy Pastis, a widow with an alibi and a weird story of a vanished child to tell. Meanwhile, Melrose's efforts at the gallery and at Boring's, his London club, bring him a couple of good paintings, a lone dud, and a burgeoning friendship with elderly club member Simeon Pitt, onetime art critic for the Times and slated to become the second victim of one of Grimes's least believable killers. Melrose's own life is soon at risk, only to be saved by an unlikely rescuer. Vignettes of life in Melrose's village, Long Piddleton; a pungent take on the contemporary art scene; a steady stream of loopy characters--all help to make Grimes's 15th Jury outing (The Case Has Altered, 1997, etc.) great fun. Just don't look for common sense or logic.